Welp, I am also part of a fun clan and was still able to join The Reapers. *shrugs* to each clan their own rules. The Dogfighting Module, A.K.A. Arena Commander, has been released! It's a 10.5GB-ish patch, so hop to. 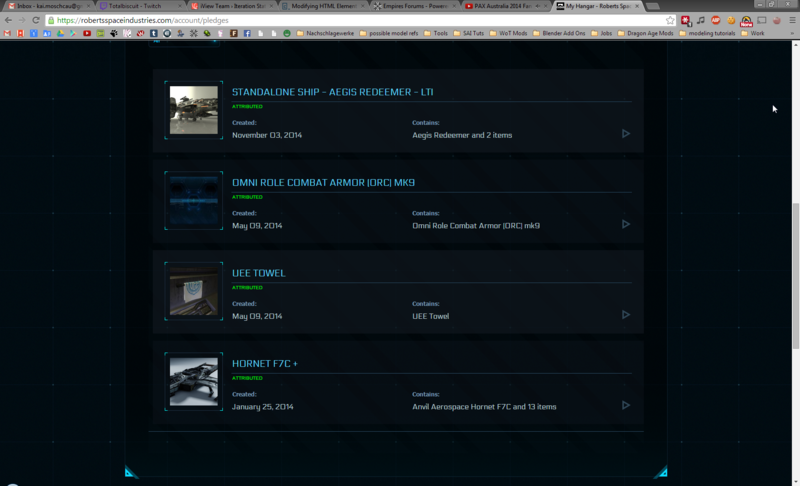 This is v0.8 of Arena Commander, and includes only the standard Anvil F7C Hornet, RSI Aurora ES, and Origin 300i. Variants of these will be supported later; for now, if you have an unsupported variant of one of these, but not the base model, you'll be given access to a "loaner"/"trainer" ship to use. If you have a game package that includes Alpha access, but does not include a ship from any of these model lines, you'll get a loaner/trainer Hornet to use. v0.8 initially only has single-player Free Flight and Vanduul Swarm (NPC waves) game modes. Multiplayer access is being rolled out gradually, based on your citizen ID number (earlier backers get in sooner). v0.9 will, based on the current plan, add the multi-crew ships (Freelancer, Constellation) and variants of the single-seat ships. v1.0 will add more environments/maps, the FPS boarding-action mechanics in conjunction with the new "Capture the Idris" mode, and will move everything over to double-precision location data (which takes full advantage of 64-bit processing and allows for significantly larger maps). I agree with the general excitement. Do you have an idea of how the Guilds/Clans will function? They are already there, you can already make them. Hoofington Reapers already exists, led by me and Shady atm. The Redeemer? Yeah, I picked up one of those as well. This has literally nothing to do with the thread.